Colour Your Way Empowered During the Breast Cancer Journey!If you or someone you care about is battling breast cancer, you know that maintaining a positive attitude is an invaluable tool for healing. 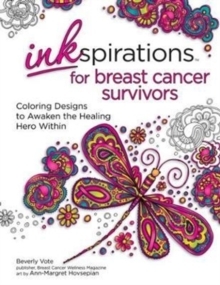 Inkspirations for Breast Cancer Survivors was created by Beverly Vote, a breast cancer survivor, to help you de-stress, recharge, and renew so that you can awaken your healer within. Beverly Vote created Breast Cancer Wellness Magazine, a quarterly, full colour publication that goes directly to thousands of breast cancer patients and survivors in all 50 states as well as to several thousand mastectomy centres, support groups, and breast cancer centres. The magazine was the 2007 recipient of the Don Ranly Publishers Award for Best Issue in its category. In 2012, she was the recipient of the Tigerlily Foundation Transformation Award and in 2014 received the Pink Angel Honoree award. Breast Cancer Wellness Magazine has a circulation of 86,000 a quarter, with over 28,000 paid subscribers. The magazine has 31,000 contacts; 8,000 likes on Facebook; and relationships with all of the national oncology, radiology, surgical and mastectomy centres.